Behold the eye candy for girls and gaysters. Great film, now I'll have to read the story by Annie Proux. 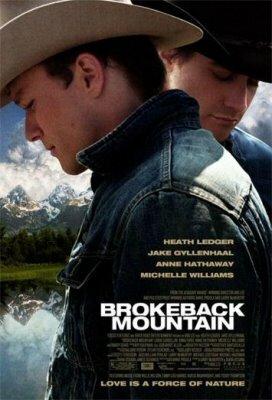 Larry David (Seinfield and Curb Your Enthusiasm) wrote an opinion piece in the New York times saying he couldn't be dragged to the film as he might suddenly find two cowboys kissing somewhat arousing and as a straight man, that's all a bit too scary. I thought it was a brave thing to admit but a (straight male) friend of mine thought Larry David was being disingenuous, homophobic, and was missing on a great film.